He struggled to hold down a job, one friend said, and had issues with alcohol and other drug use. Terry Houghton created art with whatever he could find when he was living on the street — bits of metal, scraps of wood, the leg of a plastic doll. 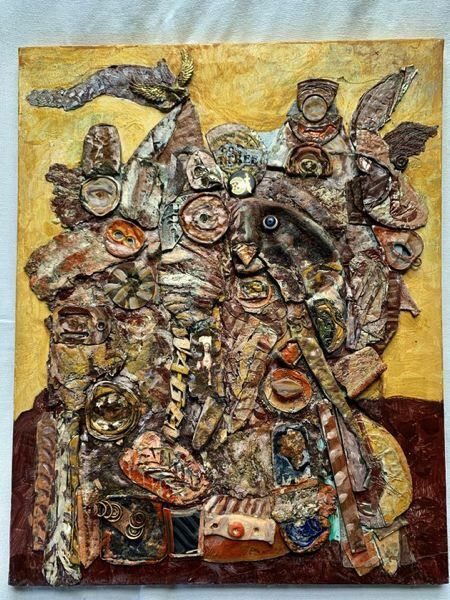 In his work, the scraps became collages sprawled across the canvas. A piece of glass could be a halo around the head of Christ. A bit of wood could be connected to an illustration of a human heart. Houghton's work was obsessive, according to his friend and fellow artist Carola Penn. She believes it might have helped to keep him alive when he was living on the streets of Portland. Houghton died around 2012, after he fell off a park bench where he'd been sleeping downtown and hit his head. There was no obituary or memorial service. For years, his art sat in Penn's basement. Seven years after his death, Houghton's art is out of the basement and on display at the nonprofit Street Roots, as part of the monthly First Thursday art celebration. It's the first known time that Houghton's work has been shown in Portland. Click here to read the rest of the story by OPB, a media partner of the Portland Tribune.